During their Spanish classes, the students in Mrs. Russell’s Pre-K class and in Grade 4 enjoyed presentations by Mrs. Adriana Mascha, a native of Colombia, and her son Emmanuel, a kindergartener in Mrs. Russell’s class. They graciously shared some of their cultural traditions, including dance, food and coffee. Fourth graders also enjoyed learning about Columbian traditions as they smelled Columbian coffee beans and tried a Colombian song and game, “El Puente Está Quebrado” (“The Bridge is Broken”). ¡Qué divertido! How fun! ¡Muchas gracias, Señora Mascha! Sixth-grade inventors showcased their problem-solving skills and creativity at the 10th annual Rubber Band Invention Showcase! Students created inventions for the National Rubber Band Contest and presented their prototypes to Lower School classes. The students had such fantastic designs and they marketed their products handily! Pictured is Lauren Ludlow '25, whose Game Bumpers invention was a school-wide favorite and solved the problem of having your dice fly off the table on family board game night! Kudos to the sixth-grade students on this STEM project. Last week, the sixth-grade class traveled to Cornerstone of Hope Bereavement Center in Independence for a morning of service. The class toured the beautiful grounds and facilities learning how Cornerstone was founded and how they help grieving families. 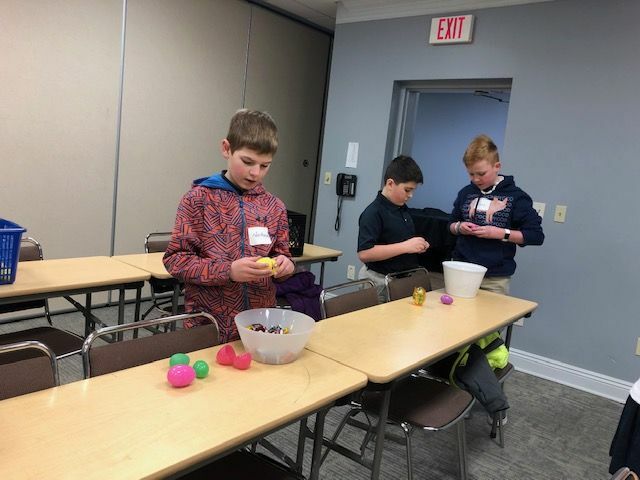 The group filled Easter eggs and decorated paper bags for their annual Easter Egg Hunt and breakfast for families in need. It was a lovely day of service and prayer rooted in our Holy Cross mission. The fourth and fifth graders will be joining Holy Angels Parish in Chagrin Falls to assist with their “WE CAN” food drive.WE CAN all help by contributing to this important corporal work of mercy, “feeding the hungry.” The students will travel to Holy Angels on Monday, April 29 to sort, package and organize all the canned goods collected at the Lower School. Fr. Max, the pastor, will bless the food and lead them in Mass. They will then load the food and deliver it to the Chagrin Falls Park food pantry on their way back to school. We hope you will join us in extending our Gilmour hospitality and Lenten almsgiving. “WE CAN” DONATE AND SERVE OTHERS. Our drive will run from April 8-April 29. The Girl Scouts have been meeting at the Lower School on a regular basis and have tackled some exciting topics within the areas of cybersecurity and robotics. Read Mrs. Johnson’s recap of everything they’ve been up to! The first three Girl Scout meetings focused on earning three badges on cyber security. The first badge was cyber security basics. The troop discussed how to use technology, what technology can do, how to create layers of security, real life safety rules for when online and how messages travel on the Internet. The group learned vocabulary such as the meaning of cyber security. The next badge was cyber security safeguards. The girls learned that a lot of information passes through computers - names,addresses, etc. - and how to keep information private online. They learned about sharing information, what is safe to share online and the need to be careful about who to trust online. They also tested their knowledge of online safety rules. The third cyber security badge was the cyber security investigator. The girls learned that computers use codes to send information. They investigated what’s real and fake in certain photos, learned about digital footprints, investigated how computer viruses can spread and explored a cyber attack. 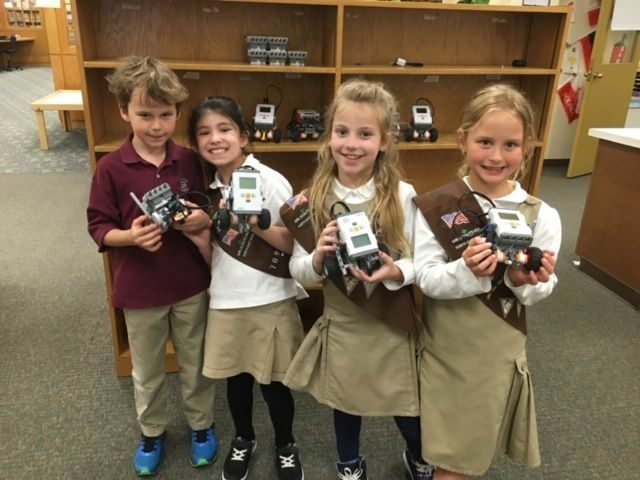 The following three badges were on Brownie robotics. The troop learned the basics about programming robots at the first meeting. They created simple machines, learned about robot senses and learned the basics of programming. Each girl drew their prototype robot and shared with the group what their robots would do. They learned the six ways that robots move and the proper name for each and they learned vocabulary words such as prototype, algorithm, program and debugging. The next meeting was for designing robots. The girls learned how robots imitate nature and learned about the parts of a robot. They discussed that once engineers create a prototype, they test it to find ways to improve and redesign their new products. The last badge was called showcasing robots. The troop learned four interesting things that you can do if you’re a robotics engineer. They discussed that when they get to Middle School and Upper School, they can join a robotics team and compete with their very own robots. The highlight of the last meeting was when Mr. Vanek came in and taught the girls how to code on a laptop and then transfer the code to the robot and watch the robot in action. He set out cones and taught them how to program the robots to weave in and out of the cones by including the correct amount of straights and turns by trial and error. All the girls were very excited to watch their robots move based on how they entered the codes. It was such an exciting time to be able to expose the girls to the wonderful educational opportunities at such an early age. Thank you to everyone at GA who supports us and allows us to meet after school! Saturday, May 4 - Gr. 2 Jesus Day Retreat, 10 a.m.
Monday, May 20 - LS Mass, 9:15 a.m.